Luxury bedroom suite, flexible, spacious accommodation. Stylish washroom, leading to wet room and separate bathroom. 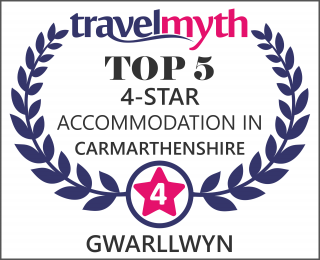 A unique bed & breakfast experience close to Llandovery with spacious and flexible accommodation . You will be our only guests and have complete privacy, even at breakfast, as an extensive continental breakfast is included for you to enjoy, at the time of your choice, in your impressive self-contained suite ( a converted barn attached to the main house with your own private entrance). See our guided tour video below. We have a minimum stay of 2 nights. We are situated just two miles from the A40 to the east of the old drover town of Llandovery. The location is very peaceful – the house lies just off a very quiet single track lane and has spectacular panoramic views over gently rolling hills, grazed by sheep and cattle. The area is popular with holiday makers, walkers, cyclists, bird watchers and horse riders. We are located between the Halfway and Crychan forest and very close to The Brecon National Park. There are some beautiful walks through fields and woodland accessible directly from the property. Why not leave the rat race behind for a while and enjoy the breathtaking views, take time out to watch the red kites soaring down our valley. The Brecon Beacons National Park was accredited the prestigious “International Dark Sky Reserve” status in 2013, only one of five globally. The night skies over Gwarllwyn are truly magnificent. A secluded part of our beautiful garden is reserved for guests, so you can sit outside and enjoy the surroundings. Please read the comments from our guest book to get a feel for Gwarllwyn. We are very proud of our guest book which has become something of a work of art with many drawings of visits by adults and children alike. Click on the images to see full size. Well-behaved dogs may stay – but must be kept on a lead whilst on the property as we have free-range cats, chickens and sheep. Please see guided tour video. FIND US: The A40 runs from Brecon to Llandovery. Coming from the Brecon direction stay on the A40 until 2 miles before you reach Llandovery. If your sat nav tells you at Halfway to turn off the A40 at Pentre Bach ignore it unless you have a 4×4 and are willing to use it. Continue on the A40, you will see a sign to your right ‘Pentre Ty Gwyn & Babel’. Take this turn. Proceed 100 yards down the hill, over small hump-back bridge facing a bungalow . (Don’t follow Country House B&B sign – that is someone else!). Turn sharp RIGHT at the Post box. Proceed exactly 2 miles along a very narrow winding lane (Take care – you may meet a tractor). Gwarllwyn is the second house on your left – metal gate down to the drive – house name beside the gate. This gate brings you in to the back of the house. Follow the drive way down towards the barns, a parking area is available directly outside the front door. If coming from the Llandovery direction on the A40 – take the Pentre Ty Gwyn & Babel sign on your left two miles out of Llandovery – then proceed as above. If using SAT NAV – our post code – SA20 0RR will bring you to the house (if coming from Brecon stay on the A40 until you see the sign for Babel/Pentre Ty Gwyn). Click here for an interactive map of the location.